100 piece assortment of the best quality twisting balloons, 260 size (pencil balloon) is about approximately 2 inches in diameter and 60 inches in length when fully inflated. These balloons withstand rough twisting, which makes them great for learning because they won't break so easily. 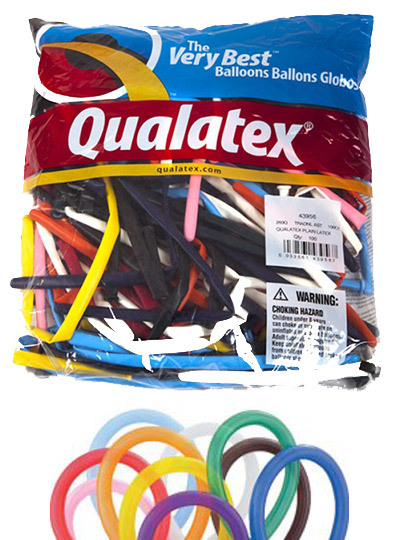 The Qualatex “Traditional Assortment” contains a mix of the following colours: pink, pale blue, white, onyx black, quartz purple, sapphire blue, emerald green, ruby red, citrine yellow, and mandarin orange.